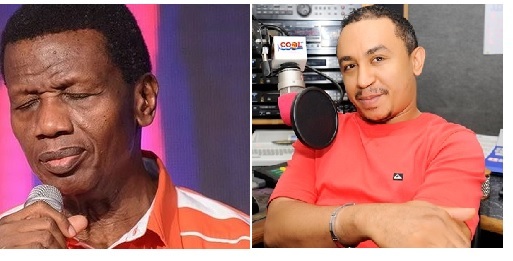 Leader of Free The Sheeple Movement, Daddy Freeze has invited the General Overseer of Redeemed Christian Church of God, Pastor E.A Adeboye to come sit over a beer with him to discus the scriptures for turning down his debate challenge. Daddy Freeze made this call on Instagram after Pastor Adeboye turned down his debate challenge to discus about tithing in the church. “I have challenged their GO Enoch, to a debate on this several times to no avail. if he is doesn’t want a debate, we can sit over a beer and discuss the scriptures”. He added that pastors hold guns to member’s heads to make them pay tithe. He described tithing as a false doctrine and that Christ NEVER collected tithes, neither did his disciples. And they say pastors don’t hold guns to member’s heads.. Please can someone explain what is RCCG is doing in this picture? – Tithe is a false doctrine for Christianity, I have proven this scripturally several times! Christ NEVER collected tithes, neither did his disciples! – I have challenged their GO Enoch, to a debate on this several times to no avail. if he is doesn’t want a debate, we can sit over a beer and discuss the scriptures and I can offer to teach him the real truth about Christ for free!